A relocation to London is more than just moving from Point A to Point B and having new experiences. It’s also accomplishing the same everyday stuff you’ve always done and will still need to do. Ask any expat: figuring out where to buy what is tough. Luckily, we know the best places to shop and can advise on what’s available in the area of your new apartment. Most neighbourhoods have what is called a “high street,” which is a main street lined with mainstream chain stores. To centralize your shopping, Westfield has massive malls located in Shepherds Bush and now Stratford City in London. Designer and vintage boutiques likewise scatter the city—it’s all a matter of knowing where to look, from the fanciest to funkiest of neighbourhoods. You’ll discover so much on your own, but your Relocation agent can point some out in advance during your flat search. Top London grocery chains include M&S Simply Food, Waitrose, Tesco, Sainsbury’s, and The Cooperative. Expats from the States also seek out stores like Partridge’s that import American foods. (There are specialty stores accommodating many other cultures, too, so let your Relocation agent know your food requirements.) Another alternative that makes for a pleasant outing is finding fresh produce and meats at any of London’s farmer’s markets—most renowned is Borough Market near London Bridge. Some of the poshest clothing shopping to be had is found on and off streets like Regent Street, Knightsbridge, Sloane Square, and the Kings Road. 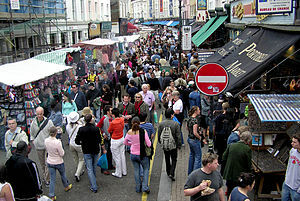 For food, the world’s largest Whole Foods is located on Kensington High Street. M&S Simply Food and Waitrose arguably offer highest quality bang for the buck versus non-chain specialty food stores. There’s loads more shopping alternatives out there, though. And quality, prices, and locations will vary, so your London Relocation agent will let you know what’s available in your specific London neighborhood.